With the American Dental Association reporting that an adult between the ages of 20 and 64 has three or more decayed or missing teeth, it is unsurprising that the market for individuals who need dental implants is strong. Although dental implants have helped millions since its introduction, many people are still unaware of the life-changing benefits. As a dental provider, that’s where you can help! Now more than ever, it is imperative that you increase dental implant marketing efforts to reach more patients. Once these strategies are implemented, your practice will see an influx of high revenue patients. As mentioned previously, the average adult has three or more decayed or missing teeth, which means that a large segment of adults may be eligible for dental implants. One way to identify your ideal audience for your dental implant marketing strategy is by identifying your prospective patient’s geographic location. Remember that most patients are interested in finding a provider near them. Using your patients’ demographic data, you can identify a target radius around your practice and strategize how to target around your area. Look through your patient records to get an estimate of how far patients are willing to drive to your practice. With this location information, you can accurately tailor campaigns. Use paid search ads to accurately target a certain radius around your practice. You’ll be able to serve ads to prospective patients who are interested in dental implants and are actively researching the procedure on sites like Google, Bing, etc. Pew Research Center reports that 89% of American adults use the internet and 77% go online at least daily. Also, a McKinsey study on consumer health insights found that 73% of those surveyed preferred a digital solution when searching for a doctor. This means that more patients are spending time online when looking for new services, have questions, or need more information. Not only is a website critical to your marketing strategy, but you’ll also want to start a blog. This blog would live on your site and will give you a platform to further educate patients about dental implant procedures and other dental topics. The last thing search engines want to do is direct searches to an outdated site. If a patient who is researching about dental implants happens to land on your blog, they’ll see its full of useful information. They might book an appointment because of your extensive knowledge! Blogging consistently will show prospective patients that you know about the latest health care information and want to engage patients. Most practices might not think that developing a social media marketing plan is needed to attract patients. Think again. A study by Pew Research finds that seven in ten Americans “use social media to connect with one another, engage with news content, share information, and entertain themselves” and approximately 68% of U.S. adults use Facebook. That’s a large segment of people you’re missing out on if you don’t have a social media plan in place. Create accounts for commonly used social media platforms. Facebook and Twitter are great places to start. Make sure you can monitor these accounts and post regularly, so don’t create too many initially. Consider using a social media management tool, like Hootsuite, to schedule your content. It saves time, and you can post at optimal times that see the most engagement. Share your blog posts so that the social media traffic will get directed to your blog and website. It’s also important to engage with your audience. Respond to appropriate comments to build a relationship with your followers. Prospective patients that come across your social media profiles will see that you care about your patients and your practice. Did you know that 88% of prospective patients trust online reviews as much as personal recommendations? With this in mind, how are the online reviews for your practice? Are they accurate? If the majority of your patients are happy with your services, a few bad reviews can create an inaccurate online reputation. Bad reviews can deter patients from choosing you as their provider. So, how can you tackle your online reputation and monitor reviews? Use review management software. It can automatically send surveys to your patients to ask them to rate their experience. It also encourages patients to post their reviews online to sites like HealthGrades, Vitals, Google, ZocDoc, etc. The more positive reviews you have, the more you’re likely to be chosen as their dental implant provider! It will also improve your search ranking results and build credibility. Remember to respond to online reviews to show that you care and you’re listening. Are patients happy with their experience? Where could your practice improve? Monitoring online reputation will not only aide in marketing your practice to more patients, but it will also enhance your patient care. 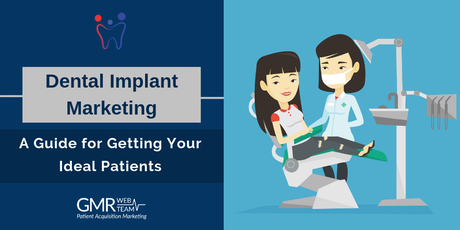 Now that you’ve crafted your dental implant marketing strategy make sure to monitor your campaigns. Determine what key performance indicators are essential to you. Impressions, likes, comments, clicks–there’s a multitude of KPIs that help you see what is working and what isn’t. Use tracking tools, like Google Analytics, to give you insights into who is engaging, what they’re liking, and more. Are specific blog posts performing better than others? Which social media posts are seeing more likes and comments? If you don’t know how your campaigns are doing, you will continue with strategies that aren’t producing results. Healthcare digital marketing experts are experienced in improving patient engagement and attracting more patients. At GMR Web Team, we are a team of professional healthcare marketers who implement these strategies to maximize results. To learn more, call us at 800-523-7187.